Lanzarote is on the north of Fuerteventura in the Canary Islands complex, situated in the Atlantic ocean, about 125 km on the west of the coast of Africa. It is known as the Hawaii of Europe. It can get big, powerful waves throughout October to March, but is consistent enough throughout the rest of the year. Good waves can be found throughout the year, no matter when you visit. The island has it’s own airport, Arrecife (ACE). Best beginner spots: Orzola, Jameos del Agua, Arrieta, Las Cucharas and Famara. Hossegor is one of France’s most consistent surf spots, located on the coast of the Cantabrian Sea. With good conditions through out the whole year. September and October are the best months, as the water is still warm, the waves get bigger, the weather is stable and the tourist season is over. At this time of the year the World Surf League (WSL) Quiksilver Pro France is held. You can fly to Biarritz (BIQ), go by train to Biarritz from any bigger french city or drive to Hossegor with your van. Peniche is a surfing place on the Atlantic ocean, north west from Lisbon, with perfect offshore waves. It has great natural beauty, an amazing landscape and good surfing vibes. The best months for surfing, with more consistency and bigger swells are during the period that goes from October to March. You can fly to Lisbon (LIS) and then drive for 85 km straight to Peniche. Most popular spot: Supertubos. Other great spots in the area: Consolação, Foz do Arelho, Lagide, Molho Leste, Praia Azul, Praia Da Areia Branca, Santa Cruz. The Banzai Pipeline, or simply "Pipeline", it is a surf reef break located in Hawaii, in Pupukea on O'ahu's North Shore. You can always catch waves in Hawaii, even though in the winter months from December to February waves are bigger, consistent and constant. You can reach O'ahu by flying to the Honolulu (HNL) International Airport, which is the travel hub of the Hawaiian Islands. As a state of the United States, entry to Hawaii is dependent upon the same entry requirements of mainland USA. 100 km south from San Francisco on the Pacific Ocean, Santa Cruz has been named by the Surfer magazine as the best place in the US to eat, sleep, work and shred. Santa Cruz’s waves accommodate all levels of surfers offering big wave spots or easy ones for the beginners. Even though it is possible to surf during the whole year, best wave conditions are found from mid autumn to mid springtime. In summer time waves are flatter. The nearest airport is in San Jose (SJC), about 50 km away. Otherwise you can also fly to San Francisco (SFO). 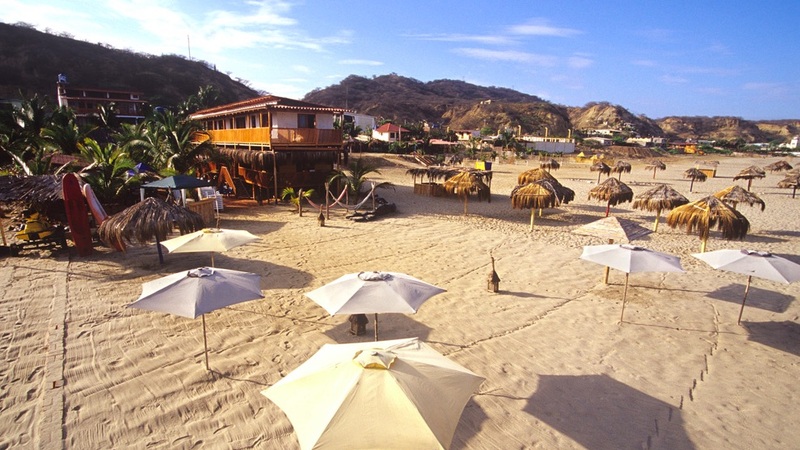 On the north of Peru on the Pacific ocean, Máncora is an all year warm water spot. It is a small fishing village with a rolling lefthand pointbreak that has nice walls, and depending on how much sand is covering the rocks, a few tube sections. On the North Coast, the waves are largest between January and March, although you will find consistent waves all year-round. The weather is more stable and drier from May to October, being May and September the nicest months. You can fly to Lima (LIM) and then take another flight to the north, to Talara (TYL). From there you still have 80 km by car or by bus to Máncora. 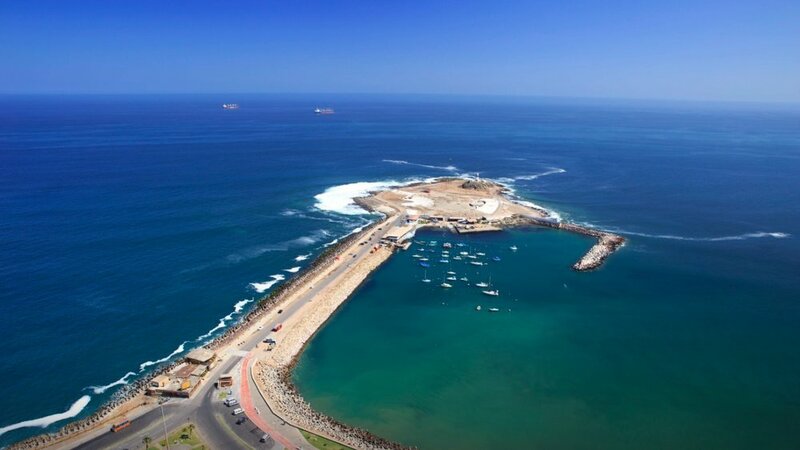 On the Pacific ocean, on the far north of Chile by the border with Peru lies the town of Arica, with perfect strings of reefs in the driest desert in the world, the Atacama. Most northern breaks are gnarly reef breaks, breaking close to the shore. Powerful swell on one hand with board breaking conditions on the other hand. The waves in the north of Chile are best in spring, between the September to November, while in the summer months, from November until March, swells are less powerful and waves flatter. To reach Arica you can fly from Santiago (SLC) to Arica (ARI). Santa Catarina is a state in southern Brazil. With a long Atlantic coastline and several islands, it's known for its beaches and mountains. We recommend Santa Catarina for a surfing road trip! Best spots are: Praia Joaquina, Imbituba, Itapoá, Praia Mole, Itapema, Jaguarana and Garopaba. April to October is the best time to go. You can fly to Florianopolis (FLN) from any bigger Brazilian city. It takes a one hour flight from São Paulo (SAO) to reach Florianopolis. The are a volcanic archipelago in the Pacific Ocean. It's considered one of the top destinations for wildlife-watching. A province of Ecuador, it lies about 1,000 km off its coast. The Galapagos Islands have waves all year round. The best months for surfing are December through February with most of the biggest and best breaks coming from north swells. You can reach Galapagos by flying with Tame, Avianca and LATAM. All operate from Quito (UIO) via Guayaquil (GYE) to Baltra (GPS). Elands Bay is situated in the Western Cape Province, on the Atlantic Ocean, The town is about 220 km north from Cape Town. Described as surfing heaven, the shores have perfect left waves, that allows for high-performance surfing, speed runs, and lip turns, as well as the ideal canvas for old-school carving. Winter - mid June to mid September - is the best season for surfing in this area. We recommend flying to Cape Town (CPT) from any mayor city in the World. 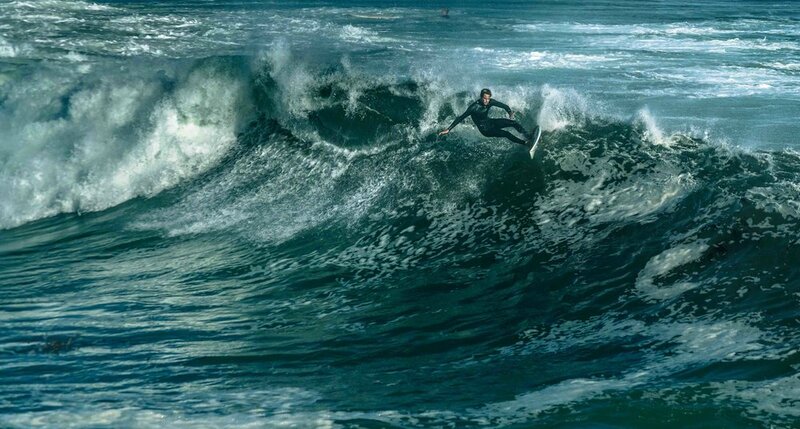 Located 700 km west from Cape town on the Indian sea, it is one of the five most famous surfing destinations in the world and hosts the annual World Surf League (WSL) surfing event at Super Tubes during July. A very long, fast, tubing right hand point break breaks along the west side of the bay. The break is regarded as one of the best right hand point breaks in the entire world, in both consistency and quality. The best time for surfing is June to August, with good enough waves running from April to September. We would recommend flying either to Johannesburg (JNB) or Cape Town (CPT) and then connect to Port Elizabeth (PLZ), which is only 85 km away from Jeffrey’s bay. The village of Busua in south-west Ghana, located on the shores of the Gulf of Guinea on the Atlantic Ocean is the home of the country’s surfing. It is perfect for beginner to intermediate surfers, but the more experienced can make easy trips along the coast to find more challenging, quieter and unexplored waves. The main surfing season is in the winter, from mid December to March. You can reach Busua by flying to Accra (ACC) first and then taking a 40 minute regional flight with Africa World Airlines to Takoradi (TKD) which is only 40 km away from Busua. Ghana is a safe and stable country with relatively low crime levels compared to other West African countries. As it is a tropical country, the WHO recommends the following vaccines: typhoid, hepatitis A, hepatitis B, cholera, yellow fever, rabies, meningitis, and influenza. Taghazout is a small fishing village about 20 km North of Agadir. It has developed into the surfing mecca of Morocco, with multiple world class waves all within a 15 minute drive. Killer point, it is a renowned point break named after the visiting pod of Killer Whales. This is probably the most consistent of the point breaks in Taghazout. Surfing is best between late September until the end of April. We recommend flying to Agadir (AGA). From there it is a 45 km drive to Taghazout. You can either take a taxi from the airport to Taghazout, or you can take the local bus to Agadir and then take the 32 or 33 bus to Taghazout. Cloud 9 is the name of the most famous wave in the Philippines, and Siargao Island is regularly rated as one best surfing spots in the world. Its thick, hollow tubes make it ideal for surfing, especially from November to April when the waves have a powerful swell. The island itself is a paradise for diving and surfing. Reaching Siargao takes at least two days if you are flying from Europe and definitely you have to be patient. We recommend you flying to Manila (MNL) via Beijing (PEK) . Other connections run through Doha (DOH), Guangzhou (CAN) and Abu Dhabi (AUH). The best way to reach Siargao from Manila is to take a domestic flight via Cebu City (CEB) to General Luna (IAO) in Siargao. From the airport you have around 30 km to the Cloud 9 spot. Bali is an Indonesian island known for its forested volcanic mountains, iconic rice paddies, beaches and coral reefs. It is a great place for a surf trip: waves, great weather, warm water temperatures and friendly locals. Bali picks up the swells from the Southern Ocean. The best season is from April to November, with consistent surf of up to 12 ft (3.65m). This is also the dry season so it’s the best time to come! If you are travelling from Europe, we recommend flying to Shanghai (PVG) and then to Denpasar (DPS), capital city and main hub for Bali. They are a chain of around seventy islands and islets approximately 150 kilometres off the western coast of Sumatra in Indonesia. With a total population bellow 80,000, it is much less populated than other parts of Indonesia. The islands offer some of the best surf to be found anywhere in the world, with more perfect left and right handers in one region than anywhere on earth. Waves can range from fun sized walls to great stand-up barrels. The most consistent surf season is between March and October/November. This coincides with the dry season. Padang (PDG) is the gateway to the Mentawai Islands, located on the west coast of Sumatra. There are daily flights from Kuala Lumpur (KUL), Singapore (SIN) or Jakarta (CGK) - Soekarno-Hatta International airport. Australia is the mecca of surfing and an excellent destination for a surfing road trip! Snapper Rocks is a small rocky outcrop on the northern side of Point Danger at the southern end of Rainbow Bay on the Gold Coast, Queensland, Australia (Eastern coastline). On the shores of the northern Tasman sea, it is one of Australia’s most famous waves and still one of the best, crowds aside. The best surfing is on the end of the summer in March and in the beginning of springtime in September. The best way to reach Snapper rocks is flying to Brisbane (BNE) which has daily flights to Shanghai (PVG). 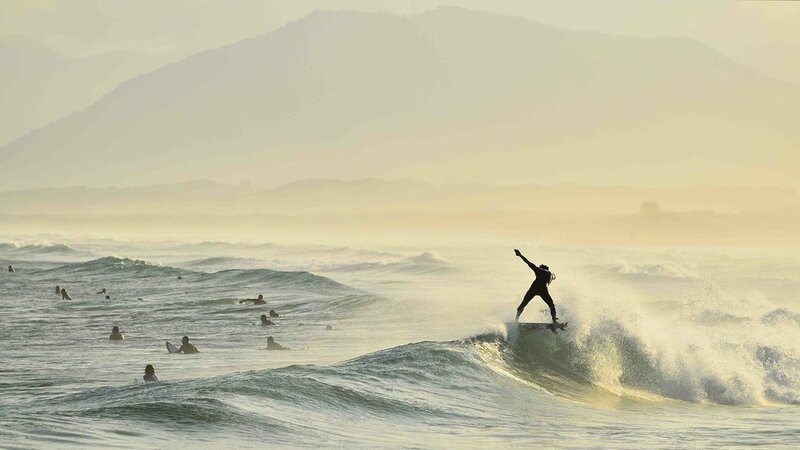 2 hours south from Snapper Rocks, you will find Byron Bay, another great place for surfing! New Zealand is a top destination for a surfing road trip! Raglan surf found its way to worldwide fame in the iconic 1966 movie “The Endless Summer”. With world-class surf breaks and consistent waves, it is a hot-spot for surfers. Raglan’s famously long left hand break runs along a rocky shoreline, encompassing three bays, with many spots around, namely Manu Bay, Whale Bay and Indicators. The rocky seafloor makes for consistent waves between four and six feet. It’s a great place for learners due to its tamer waves! Located in the North Island, it is less than two hours drive from Auckland (AKL) to the south. It is an all year round spot, though the best waves are found from late summer through early winter, from March to July. Piha features a solid beach break which is renowned as a top surf beach in New Zealand. The black sand beaches make a scenic spot. The small coastal settlement, with less than 700 people and just 40 minutes away from Auckland (AKL) is an amazing place to disconnect in the North Island on the shores of the Tasman sea. The area has retained much of its natural beauty and isolation. It is an all year round spot, though we would recommend coming in the summer months - January to March - when it is drier! Playa Hermosa is a large surfing town located 5 km south of Jaco in Puntarenas Province, in the Central Pacific region of Costa Rica. The black sand beach is one of the most famous beaches of the country because of its perfectly shaped surfing waves that are consistent all over the year. Playa Hermosa features low crowds and a calm Pacific Ocean. Beginners should head to nearby Jaco, as the waves are easier there. The waves are most powerful from April to November. You can reach Playa Hermosa from Jaco, by bus or by taxi. There are regular daily buses from Jaco to San Jose (SJO) airport.